Lockheed Martin’s unmanned SR-72 aircraft concept has surfaced again with renewed vigour, with company leadership now pushing a reusable, air-breathing hypersonic vehicle as an “affordable” way to validate a new propulsion concept for achieving speeds within the atmosphere between Mach 6.0 to Mach 20. 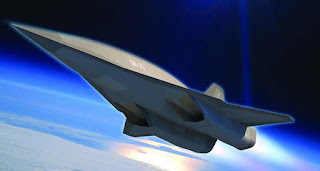 Speaking at a Lockheed media event in Washington DC on 15 March, company chief executive Marillyn Hewson confirmed that the company is building on “several breakthroughs” made during the short-lived HTV-3X Blackswift hypersonic testbed, which was de-funded by Congress in fiscal year 2009, to develop “a controllable, low-drag aerodynamic configuration capable of stable operation from takeoff to subsonic, transonic, supersonic and hypersonic to Mach 6”. Hewson, while displaying an artist’s rendering of the SR-72, said it would cost “less than $1 billion” to develop and fly a demonstrator aircraft the size of an F-22 Raptor. Devised by Lockheed’s Skunk Works division, SR-72 employs a turbine-based combined cycle propulsion system to get above "Mach 1.5 to 2.0," at which point it would begin converting to a supersonic combustion ramjet for speeds beyond Mach 6. That’s according to Skunk Works head Rob Weiss, who confirmed that it would be an unmanned vehicle, at least at first. Hewson says the company’s long-term ambition is to “enable hypersonic passenger flights and easier access to space”. The company’s militarised spinoffs could be an air-breathing, hypersonic reconnaissance aircraft, or perhaps even new fighters and bombers further along. Lockheed revealed its next-generation version of the famed SR-71 Blackbird, the SR-72, in 2013 and has said it would hope to introduce a reusable hypersonic aircraft in the mid-2020s or so. The challenge is transitioning through Mach 3.0 – since modern turbojet engines are only capable of powering an aircraft to Mach 2.2, whereas typical ramjets don’t work below Mach 4.0.